1800: born in Edo. His father is the publisher Fukuchi Mohê IV and his mother is the daughter of Tomoeya Shôbei. His father is also a manager at the Ichimuraza. 11th lunar month of 1812: he makes his first appearance on stage at Ichimuraza, receiving the name of Ichimura Takesaburô and playing a child role in the drama "Gohiiki Megumi no Amagoi". 11th lunar month of 1813: Ichimura Takesaburô takes the name of Ichimura Kamesaburô at the Ichimuraza, playing the role of the yakko Kitsuhei in the kaomise drama "Modoribashi Senani Gohiiki". 3rd lunar month of 1814: premiere at the Ichimuraza of Tsuruya Nanboku IV's drama "Sumidagawa Hana no Goshozome", commonly called "Onna Seigen"; Kamesaburô plays the roles of the Shinkiyomizu's young bonze Sakuranbô and Ôtomo's son Hôshimaru [more details]. 1816: Kamesaburô is adopted by Bandô Hikosaburô III. 11th lunar month of 1816: Ichimura Kamesaburô takes the name of Bandô Hikosaburô IV at the Nakamuraza, playing the roles of Hosokawa Masamoto and Umezu Kamon in Shinoda Kinji I's kaomise drama "Fuwa Nagoya Yuki no Dategasa". 7th lunar month of 1818: Hikosaburô plays at the Miyakoza the roles of Yoshitsune, Kokingo, Yasuke and Taira no Koremori in the classic "Yoshitsune Senbon Zakura"; the roles of Shizuka Gozen and Osato are played by Nakamura Daikichi I. 4th lunar month of 1819: Hikosaburô plays at the Tamagawaza the role of Senzaki Yagorô in the classic "Kanadehon Chûshingura". 3rd lunar month of 1820: premiere at the Tamagawaza of Tsuruya Nanboku IV's drama "Sakura Butai Maku no Datezome"; Hikosaburô plays the role of Yamanaka Shikanosuke [casting]. 8th lunar month of 1820: Hikosaburô plays at the Tamagawaza the roles of Sakuramaru and Sukune Tarô in the classic "Sugawara Denju Tenarai Kagami". 9th lunar month of 1822: Hikosaburô plays at Ichimuraza the role of Kamatari in the drama "Imoseyama Onna Teikin". 3rd lunar month of 1823: premiere at the Ichimuraza of Tsuruya Nanboku IV's drama "Ukiyogara Hiyoku no Inazuma"; Hikosaburô plays the role of Iriya no Kinzô [casting]. 5th lunar month of 1823: Hikosaburô plays at the Nakamuraza the role of Sakuramaru in the classic "Sugawara Denju Tenarai Kagami". 5th lunar month of 1825: Hikosaburô plays at the Ichimuraza the role of Minamoto no Yoshitsune in the classic "Yoshitsune Senbon Zakura"; the roles of Shizuka Gozen and Tadanobu are played by Segawa Kikunojô V and Bandô Mitsugorô III. 8th lunar month of 1826: Hikosaburô plays at the Kawarasakiza the role of Fuwa Kazuemon in the classic "Kanadehon Chûshingura". 7th lunar month of 1827: Hikosaburô plays at the Ichimuraza the roles of En'ya Hangan and Yazama Jûtarô in the classic "Kanadehon Chûshingura". 9th lunar month of 1827: Hikosaburô plays at the Ichimuraza the role of Utanosuke in the drama "Keisei Hangonkô". His stage partners are Ichikawa Danjûrô VII (Matahei), Iwai Kumesaburô II (Otoku), Ichimura Uzaemon XII (Shurinosuke) and Kataoka Nizaemon VII (Shôgen). 2nd lunar month of 1828: his adoptive father Hansôan Rakuzen dies. 5th lunar month of 1828: Hikosaburô plays at the Nakamuraza the role of En'ya Hangan in the classic "Kanadehon Chûshingura". 8th lunar month of 1828: Hikosaburô plays at Nakamuraza the roles of Motome and Fukashichi in the drama "Imoseyama Onna Teikin". 11th lunar month of 1828: Hikosaburô moves to the Kawarasakiza. His yearly salary is 400 ryô. 8th lunar month of 1829: tour in Nagoya; Hikosaburô plays in the precinct of the Seijuin Temple. 11th lunar month of 1829: Hikosaburô plays in the same theater the roles of Kanawa Gorô, Daihanji no Kiyosumi and Motome in the drama "Imoseyama Onna Teikin". 1st lunar month of 1830: Hikosaburô plays in Ôsaka at the Naka no Shibai the roles of the yakko Edohei and Dansuke in the drama "Keisei Kagami Inazuma", which is produced by Fujikawa Katsusaburô; he also replaces Iwai Kumesaburô II in the role of Ohatsu in the drama "Kagamiyama Kokyô no Nishikie". This is the first time he plays a onnagata role and his stage partners in the roles of Iwafuji and Onoe are Onoe Kikugorô III and Asao Gakujûrô. 3rd lunar month of 1831: tournée in the province of Ise; Hikosaburô plays in the precinct of the Naka-no-Jizô temple. 3rd lunar month of 1832: Hikosaburô is back to Ôsaka; he plays at the Takeda no Shibai the roles of En'ya Hangan and Teraoka Heiemon in the classic "Kanadehon Chûshingura". 11th lunar month of 1832: Hikosaburô goes to Kyôto and plays at the Kitagawa no Shibai the roles of Itô Hyôgô and Tomizuka Jûbê in the drama "Ganryûjima". 1833: tour in the province of Kii. 6th lunar month of 1833: tour in Miyajima; Hikosaburô plays the roles of En'ya Hangan and Ôboshi Yuranosuke in the classic "Kanadehon Chûshingura". 5th lunar month of 1835: Hikosaburô is back in Edo after six years spent in Kamigata or on the road; he plays at the Nakamuraza in the drama "Murasaki ni Somete Yoshibei". 11th lunar month of 1835: Hikosaburô plays at the Nakamuraza the roles of Fujiwara no Shihei and Terukuni in the classic "Sugawara Denju Tenarai Kagami". 8th lunar month of 1836: tour in Nagoya with Asao Kuzaeon II and Mimasu Gennosuke I; Hikosaburô plays in the drama "Hime Kurabe Futaba Ezôji", which is staged in the precinct of the Seijuin temple. 9th lunar month of 1836: Hikosaburô plays in the same theater in the dramas "Katakiuchi Tengajaya-mura" and "Sekitori Senryô Nobori". 10th lunar month of 1836: Hikosaburô plays in the same theater in the dramas "Gion Sairei Shinkôki", "Some Moyô Imose no Kadomatsu" and "Hirakana Seisuiki". 1st lunar month of 1837: Hikosaburô is back in Edo; he achieves a great success at the Nakamuraza by playing five roles in the drama "Soga Moyô Hiyoku no Torikumi". 6th lunar month of 1837: Hikosaburô plays at the Moritaza the roles of En'ya Hangan, Ono Sadakurô, Senzaki Yagorô, Kakogawa Honzô and Teraoka Heiemon in the classic "Kanadehon Chûshingura". 7th lunar month of 1839: Hikosaburô plays at the Nakamuraza the roles of En'ya Hangan, Ôwashi Dengo and Hayano Kanpei in the drama "Chûkô Gishi no Yurai" (similar to the classic "Kanadehon Chûshingura"). Spring 1840: Hikosaburô adopts Tetsuzô, the son of a carpenter. 3rd lunar month of 1840: Hikosaburô plays at the Nakamuraza the roles of Kumagai Tarô and Igami no Gonta in the drama "Tokimo Yoshino Senbon Zakura" (similar to the classic "Yoshitsune Senbon Zakura"). 5th lunar month of 1841: Hikosaburô plays at the Nakamuraza the role of Minamoto no Yoshitsune in the classic "Yoshitsune Senbon Zakura"; the roles of Shizuka Gozen and Tadanobu are played by Onoe Eizaburô III and Onoe Tamizô II. 10th lunar month of 1842: Hikosaburô takes part in the opening ceremony of the newly-built Nakamuraza in the district of Asakusa Saruwaka-chô, playing in the drama "Kinryûzan Chikai no Ishizue", which is produced by Nakamura Kanzaburô XII; his stage partners are Iwai Tojaku, Sawamura Tosshô II, Arashi Kichisaburô III, Onoe Eizaburô III, Osagawa Tsuneyo IV, Arashi Izaburô II and Ichikawa Danzaburô V.
5th lunar month of 1843: Hikosaburô plays at the Kawarasakiza the roles of Fuwa Kazuemon and Teraoka Heiemon in the classic "Kanadehon Chûshingura". He also plays the roles of Matsuômaru and Sukune Tarô in the classic "Sugawara Denju Tenarai Kagami". 9th lunar month of 1843: Hikosaburô plays at the Kawarasakiza the roles of Kawagoe Shigeyori, Tokaiya Ginpei, Taira no Tomomori, Igami no Gonta and the fox Genkurô in the classic "Yoshitsune Senbon Zakura". 11th lunar month of 1844: Hikosaburô plays at the Kawarasakiza the role of Fujiwara no Shihei in the classic "Sugawara Denju Tenarai Kagami". 8th lunar month of 1845: Hikosaburô plays at the Ichimuraza the roles of Kawagoe Shigeyori, Tokaiya Ginpei, Taira no Tomomori, Igami no Gonta and Ise no Saburô in the classic "Yoshitsune Senbon Zakura". 6th lunar month of 1847: Hikosaburô plays at the Nakamuraza the roles of Yazama Jûtarô, Ono Sadakurô, Ichimonjiya Saibê and Kodera Jûnai in the classic "Kanadehon Chûshingura". 4th lunar month of 1849: Hikosaburô plays at the Kawarasakiza the roles of Kô no Moronô, Ishidô Umanojô, Fuwa Kazuemon and Kakogawa Honzô in the classic "Kanadehon Chûshingura"; the roles of En'ya Hangan and Ôboshi Yuranosuke are played by Ichikawa Kodanji IV and Ichikawa Gangyoku I. 8th lunar month of 1849: Hikosaburô plays at the Kawarasakiza the role of Shigetada in the play "Kagekiyo" His stage partners are Ichikawa Danjûrô VIII (Kagekiyo) and Onoe Kikujirô II (Akoya). 8th lunar month of 1851: premiere at the Nakamuraza of Segawa Jokô III's drama "Higashiyama Sakura Sôshi" (commonly called "Sakura Giminden"); Hikosaburô plays the roles of Ashikaga Yoshimasa, the evil lord Orikoshi Masatomo, the boatman Jinbei, Maboroshi no Chôkichi and Nikki Kiyonosuke [casting]. 3rd lunar month of 1852: Hikosaburô plays at the Nakamuraza the roles of Ôboshi Yuranosuke, Ono Sadakurô, Ichimonjiya Saibê, Teraoka Heiemon, Ishizuka Rakuzen, Yazama Kinai and Uematsu Samonnosuke in the drama "Yayoi no Hana Iroha no Honsetsu" (similar to the classic "Kanadehon Chûshingura"). 5th lunar month of 1854: Hikosaburô plays at the Nakamuraza the roles of En'ya Hangan, Kakogawa Honzô, Ono Sadakurô and Teraoka Heiemon in the classic "Kanadehon Chûshingura". 3rd lunar month of 1856: great shûmei at the Ichimuraza for the Bandô branch of the Otowaya guild; Bandô Hikosaburô IV and Bandô Takesaburô I respectively take the names of Bandô Kamezô I and Bandô Hikosaburô V. The two actors play together in the dramas "Tsuruhachi to Suehiro Soga", "Hikinuide Kasumi no Midomise" and "Yume Musubu Chô ni Torioi". 7th lunar month of 1856: Kamezô plays at the Ichimuraza the roles of Yazaemon ("Sushiya") and Yokawa no Zenji Kakuhan in the classic "Yoshitsune Senbon Zakura". 9th lunar month of 1856: premiere at the Ichimuraza of Kawatake Shinshichi II's 9-act drama "Tsuta Momiji Utsunoya Tôge"; The 2 leading stars are Ichikawa Kodanji IV (the blind masseur Bun'ya and the thief Niza) and Kamezô (Itamiya Jûbê). 1st lunar month of 1857: premiere at the Ichimuraza of Kawatake Shinshichi II's drama "Nezumi Komon Haru no Shingata" (commonly called "Nezumi Kozô"); Kamezô plays the roles of Inaba Kôzô's adoptive mother Okuma, Hayase Yajûrô and Takagi Shirodayû [casting]. 7th lunar month of 1857: premiere at the Ichimuraza of Kawatake Shinshichi II's drama "Ami Moyô Tôro no Kikukiri" (commonly called "Kozaru Shichinosuke"); Kamezô plays the roles of Amiuchi Shichigorô, Dôchû-oichiji Sangorô, Hasuba Yoroku Masakazu and Jizôdô no Sainen [casting]. 9th lunar month of 1857: Kamezô plays at the Ichimuraza the roles of Takebe Genzô, Haji no Hyôei and Shiratayû in the classic "Sugawara Denju Tenarai Kagami"; his stage partners in the roles of Kan Shôjô and Matsuômaru are Kawarasaki Gonjûrô I and Ichikawa Kodanji IV. 5th lunar month of 1858: tour in Ise with Bandô Hikosaburô V; Kamezô plays the roles of Tokaiya Ginpei, Taira no Tomomori and Igami no Gonta in the classic "Yoshitsune Senbon Zakura", which is staged at the Furuichi Shibai. 6th lunar month of 1858: tour in Miyajima with Bandô Hikosaburô V and Nakamura Jakuemon I; Kamezô plays the role of Igami no Gonta in the classic "Yoshitsune Senbon Zakura". 3rd lunar month of 1859: Kamezô plays at the Naka no Shibai the roles of Takebe Genzô and Fujiwara no Shihei in the classic "Sugawara Denju Tenarai Kagami". 3rd lunar month of 1860: Kamezô plays at the Naka no Shibai the roles of Kô no Moronô, Kamura Sakyô, Ichimonjiya Saibê, Naosuke, Yazama Jûtarô, Muroi Kikaku and Kakogawa Honzô in the classic "Kanadehon Chûshingura"; the roles of En'ya Hangan, Yuranosuke and Okaru are played by Bandô Hikosaburô V, Arashi Kichisaburô III and Onoe Kikujirô II. June ~ 7th lunar month of 1860: tour in Miyajima with Bandô Hikosaburô V, Fujikawa Tomokichi III, Nakamura Jakuemon I and Ôtani Tomomatsu; Kamezô plays the role of Ôboshi Yuranosuke in the classic "Kanadehon Chûshingura". He also plays the role of Gekizaemon in "Meiboku Sendai Hagi". 11th lunar month of 1860: Kamezô plays the roles of Kawagoe Shigeyori and Igami no Gonta in the classic "Yoshitsune Senbon Zakura", which is staged in Ôsaka at the Kita-Horie Ichi-no-Gawa Shibai. 2nd lunar month of 1861: Kamezô and Bandô Hikosaburô V are back in Edo; they play together at the Ichimuraza in the drama "Chiyo no Haru Tosae no Sayaate". 10th lunar month of 1861: Kamezô plays at the Ichimuraza the role of Shiratayû in the classic "Sugawara Denju Tenarai Kagami". 3rd lunar month of 1862: Kamezô plays at the Nakamuraza the roles of Kô no Moronô, Kakogawa Honzô, Hara Goemon and Amagawaya Gihei in the classic "Kanadehon Chûshingura"; the roles of En'ya Hangan, Ôboshi Yuranosuke, Honzô's wife Tonase and Okaru are played by Sawamura Tosshô II, Kataoka Gadô II, Bandô Hikosaburô V and Sawamura Tanosuke III. 4th lunar month of 1866: Kamezô plays at the Ichimuraza the roles of Sakae Gozen and Watanabe Gekizaemon in the drama "Date Kurabe Okuni Kabuki". 7th lunar month of 1866: Kamezô plays at the Ichimuraza the roles of Ashikaga Tadayoshi, Kakogawa Honzô, Ono Kudayû, Yoichibê, Suwa Kazuemon and Ôta Ryôchiku in the classic "Kanadehon Chûshingura". 2nd lunar month of 1867: premiere at the Ichimuraza of Kawatake Shinshichi II's new year sogamono "Keisei Soga Kuruwa Kagami", in which was premiered the drama "Oshizu Reiza"; Kamezô plays the roles of Kudô Saemon Suketsune, the otokodate Shôki no Hanbê and Oshizu's father Hokke no Denji [more details]. 11th lunar month of 1868: Kamezô plays at the Ichimuraza the roles of Ashikaga Tadayoshi, Kakogawa Honzô, Amagawaya Gihei and Ishidô Umanojô in the classic "Kanadehon Chûshingura". 7th lunar month of 1869: premiere at the Nakamuraza of Kawatake Shinshichi II's drama "Kichisama Mairu Yukari no Otozure"; Kamezô plays the roles of Yoshida Chûzaemon and the kamikuzuya Ibê [casting]. 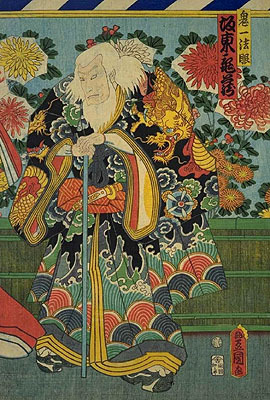 5th lunar month of 1870: Kamezô plays at the Nakamuraza the roles of Izutsu Gekizaemon and the tôfu maker Saburobei in the drama "Oni Azami Datezome Katabira", whose plot and characters belong to the "Meiboku Sendai Hagi" world. 10th lunar month of 1870: Kamezô plays at the Nakamuraza the role of Shiratayû in the classic "Sugawara Denju Tenarai Kagami". 3rd lunar month of 1871: Kamezô appears on stage for the last time, at the Nakamuraza. He retires and dies a few years later, in November 1873. His tombstone is located in the precinct of the Daiunji temple. Bandô Kamezô I was a talented and popular tachiyaku, an outstanding dancer, who excelled in nimaime (at the beginning of his career), budôgoto and jitsugotoshi roles, then in jitsuaku and oyajigata roles in his latter years. Bandô Kamezô I's best roles: Igami no Gonta ("Sushiya" scene in "Yoshitsune Senbon Zakura"), En'ya Hangan/Kakogawa Honzô ("Kanadehon Chûshingura"), Shiratayû ("Sugawara Denju Tenarai Kagami").